Joe Tizzard had an emotional last ride on stable hero Cue Card, who on Thursday left the family's Dorset yard to be retrained in showing. Tizzard, who partnered Cue Card to ten of his 16 career wins, including memorable successes in the Champion Bumper and Ryanair Chase, took the 13-year-old for a final spin as the sun went down at Venn Farm on Wednesday evening. The Jean Bishop-owned chaser has joined show horse producer Katie Jerram in Essex where he is being primed for the Royal Windsor Horse Show in May. Tizzard, assistant trainer to father Colin, said on Thursday: "He has been a legend for us and I am sure he will be a crowd-puller in those sort of [show] events. It was a bit emotional, there were a few tears and I had one last ride on him last night. We will make an effort to see him regularly, and the plan is to be at Royal Windsor next month. "He will be closer to the Bishop family, which is nice, but he will always have a home at our place. He's been in his same box for as long as we have been there. I don't know who will go in there next but they will have to be a good one!" 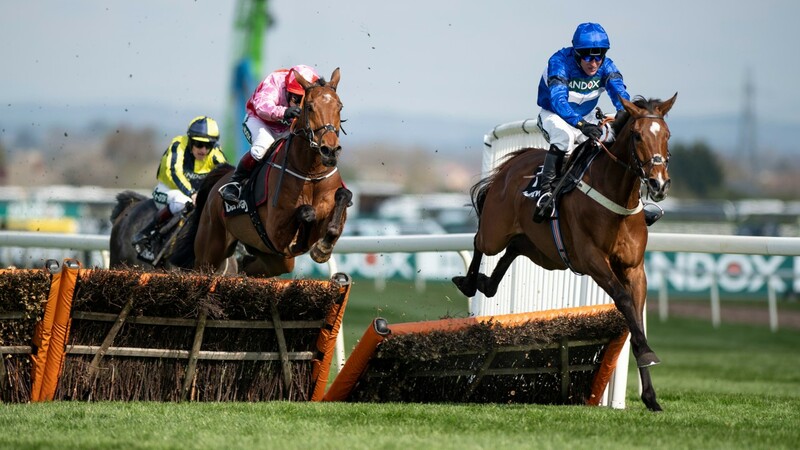 Cue Card won a King George and three Betfair Chases, amassing £1,447,454 in prize-money, and was the early flagbearer for the Tizzard team which has since enjoyed top-level success with the likes of Native River, Thistlecrack and Finian's Oscar. 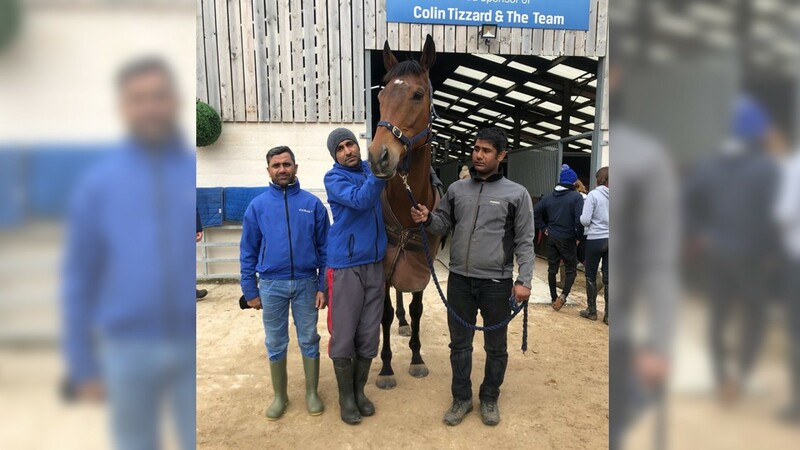 Tizzard said: "He has gone through the Retraining Of Racehorses scheme and it is a nice opportunity for him with somebody who will enjoy having him. "He is relatively young for that career [showing] and it's good that he can give someone a lot of pleasure. He was happy at our place but he is a young horse with a future career and he deserves to be doing it." Jerram reports Cue Card to have settled in well to his new surroundings. She said: "I had a big lump in my throat when he arrived because I realised how massively privileged we are to retrain such a beautiful, lovely and popular horse. "He relaxed well upon arrival and I introduced him to Barbers Shop [former chaser owned by the Queen] and they gave each other a little nuzzle. It is early days but everyone involved with him is looking forward to the next step in his life." Nine of Colin Tizzard's 28 Grade 1 career wins were courtesy of Cue Card, and the yard scored twice at the top level at the Aintree Festival last week with Lostintranslation and Reserve Tank. The progressive Reserve Tank will seek a second Grade 1 victory at Punchestown next month, where he is set to feature in the Champion Novice Hurdle on May 3. Joe Tizzard added: "Reserve Tank has come out of Aintree well, and will go to the two and a half mile race on the Friday. He has been very progressive this year, we were expecting him to run well [at Aintree] but we didn't think he would win like that. He keeps on improving and we don't know where the end of that is. "Sizing Granite and Vision Des Flos will go to the Graded races at Punchestown and then we will have a few handicappers over as well. "Lostintranslation put up a hell of a performance last week, he is a very exciting prospect and we're winding him down for his summer holiday. Native River and Thistlecrack have been turned out so they will be back next season." It was a bit emotional, there were a few tears and I had one last ride on him last night.